Beetroot, a classic winter vegetable loved by many has great health benefits. It so happens, that it also possesses excellent cleaning effects. 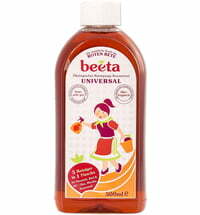 The German manufacturers, Beeta, has created a range of cleaning agent based on the properties of beetroot. Ilona Parsch, the founder of Beeta, owned a commercial cleaning company, however, experience allergic reactions due to the conventional and aggressive cleaning products that were being used. Instead of shutting down her company, she looked for a cleaning agent that was effective yet mild on the skin. And so, Beeta was borne. Thomas Parsch, Ilona's son, who studied Industrial Engineering in the field of Cleaning and Hygiene Technology, further enhanced and optimised the formula. Beetroot juice possesses a naturally high content of oxalic acid, which is also found in rhubarb and sorrel. Oxalic acid has an excellent cleaning effect, and when combined with selected raw materials such as organic acids and plant surfactants, a powerful cleaner that gets rid of stubborn stains is formed. Beeta forgoes the use of any toxins and develops their assortment based on sustainable principles. Effective cleaning power, skin tolerance and eco-friendliness are in perfect unison because only high-quality ingredients that are safe for humans and the environment have been used to manufacturer Beeta cleaning agents. Biolindo carries a wide assortment of Beeta cleaning agents, ranging from liquid detergents to various all-purpose cleaners and soaps that have been dermatologically tested and are rich in consistency for economical use.